LMAC's exhibition, "Never Let Your Wings Down", which we presented in the fall (2018) reached the birthplace of Father P. Ažubalis - Biržai, Lithuania. The exhibition introduced us to Fr. Ažubalis' life, pastoral work at the St. John the Baptist Parish, building the Anapilis complex and the history of Lithuanian Martyrs' Parish. We would like to invite all school age children to help build our history. Take a look at our webpage : Sharing Our Stories – Younger Generation and add your family‘s story. Families that have already participated really appreciated the opportunity to sit down together and focus on their family history. To participate, send and email to [email protected] and we will forward the instructions and guidelines to you. For Baltic immigrants and refugees who left their homelands in the lead-up and aftermath of the Second World War, Canada provided a safe and stable new home in which to raise their families. Their children, some born in the homeland left behind and others in Canada, grew up navigating the differences between their cultural background and Canadian community around them. This very Canadian experience of straddling two cultures brings challenges, opportunities and the unexpected. This symposium continues the narrative of the Sharing our Stories: The Baltic Diaspora at Home in Canada exhibit, which profiles the personal stories of people forced to leave their Baltic homeland and start a new life in Canada. By exploring the experiences of the next generation in Canada, it presents an opportunity to learn about and explore the nature of culture, family, community and identity within Baltic Canadian communities. 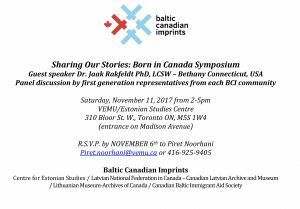 At this symposium, a group of first generation Canadians representing four Baltic cultures – Estonian, Latvian, Lithuanian and Baltic German – will share their stories about growing up as Baltic Canadians. This will be followed by an open discussion facilitated by special guest Dr. Jaak Rakfeldt (PhD, LCSW), Professor of Social Work at Southern Connecticut State University. Dr. Rakfeldt is also the Coordinator of the Co-occurring Disorders (mental health and substance use) and has over fifty publications and conference presentations dealing with mental health and substance use issues as well as with ethnic identity matters. The Sharing Our Stories: Born in Canada symposium is organized by the Baltic Canadian Imprints partnership which is made up of the Canadian Baltic Immigrant Aid Society, VEMU/Estonian Studies Centre, Lithuanian Museum Archives of Canada and the Canadian Latvian Archive and Museum (Latvian National Federation in Canada). This group has been working together since 2016. The symposium is open to everyone and will be in English. Please R.S.V.P. By November 6th to Piret Noorhani, [email protected] or 416-925-9405. As our exhibition closes this Sunday, the next opportunity to view it will be in Ottawa at the Lithuanian Canadian Days event, July 29th, 2017. For more details please go to: www.mlka.ca.